OCASI's Initiative to End Gender-Based Violence in Immigrant and Refugee Communities provides resources, education and leadership to the settlement sector and the broader community on gender-based violence prevention and survivor support. We facilitate resource development, public education campaigns, professional development and training, online courses, community-building, knowledge-sharing, advocacy, and use of the arts in order to prevent and respond to gender-based violence in immigrant and refugee communities. Our work builds on decades of expertise, as OCASI has been engaged in gender-based violence prevention work since 2002. All of our work is grounded in an anti-oppressive, anti-racist and intersectional feminist framework. Gender-based violence happens in all communities, but it impacts immigrant and refugee communities in distinct ways. 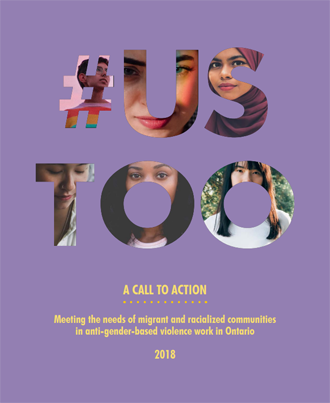 Women (including cis women and trans women) and non-binary immigrants and refugees face unique barriers to accessing support for violence or abuse. Immigrant and refugee-serving organizations have an obligation and responsibility to be informed about gender-based violence issues, and to provide compassionate, trauma-informed, and appropriate services for immigrants and refugees who are survivors of violence. The broader community must to build its capacity to prevent, recognize, and respond to gender-based violence within immigrant and refugee communities, and to support survivors. Gender-based violence in immigrant and refugee communities is a complex and sensitive issue. OCASI's online courses are designed to empower you with the knowledge you need to effectively support survivors of gender-based violence in immigrant and refugee communities. The courses are free and are offered in both English and French. See our current list of facilitated gender-based violence courses here. See our current list of self-directed gender-based violence courses here. 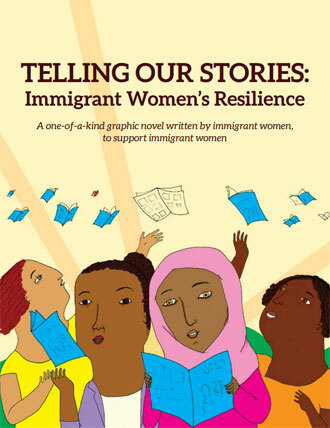 "Telling Our Stories: Immigrant Women's Resilience" is a graphic novel written by immigrant and refugee women, for immigrant and refugee women. The graphic novel deals with issues of sexual violence and violence against women. You can download it for free, and it comes with a list of discussion questions and a webinar on how to host a workshop in your community using the graphic novel. It is available in 10 languages. Download the "Telling Our Stories" Graphic Novel in English, French, Arabic, Armenian, Dari, Punjabi, Somali, Spanish, Tamil, Urdu, and Simplified Chinese. Survivors of sexual violence deserve access to support resources. This booklet was designed using imagery from the "Telling Our Stories" graphic novel described above. 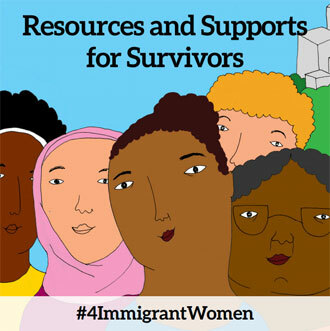 It contains a list of resources that immigrant women survivors of sexual violence may find useful. Download the support resource booklet of support resources in English, Arabic, Armenian, Dari, Punjabi, Somali, Spanish, Tamil, Urdu, and Simplified Chinese. Domestic violence is not just about physical violence – it can involve financial abuse, emotional abuse, stalking, sexual abuse, or psychological abuse. 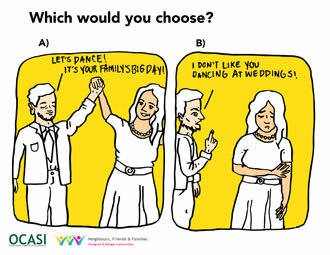 The "Which Would You Choose?" card series features different scenarios to help you understand what the different forms of abuse can look like. The cards also contain a helpful questionnaire, tips on how to support someone who is living with abuse, and a list of Ontario-based resources. The cards are available in nine languages. Place an order for cards to be delivered to your agency by contacting us. Directly download the card series in English, Arabic, Dari, Spanish, Somali, Spanish, Tamil, Urdu, and Pashtu. A poster is a powerful way to send a visual message of support to clients and community members who are survivors of violence. Place an order for posters to be delivered to your agency by contacting us. On March 2, 2018, OCASI and the Barbra Schlifer Clinic co-hosted a Roundtable on meeting the needs of racialized, immigrant, and refugee survivors of violence in Ontario. At this Roundtable, 30 leaders came together to share their expertise on policy-level change and educational interventions that are needed in order to bring about change. The results of this discussion are featured in the #UsToo Working Paper. Recognizing and Responding to Intimate Partner Violence Resource Guide for Refugee Resettlement Assistance Programs in Ontario, also known as the "RAP Guide", was a multi-agency collaborative effort. The RAP Guide was developed specifically for settlement workers in Refugee Assistance Programs in order to provide them information to understand the complex situations of government-assisted refugee women in Ontario when they experience intimate partner violence. OCASI hosts webinars that dive into specific topics related to gender-based violence prevention and survivor support. Access our webinar recordings here. The IRCNFF Campaign is an Ontario-wide campaign to raise awareness about the signs of woman abuse in immigrant and refugee communities. OCASI has a lead role in coordinating the campaign and engaging the community directly through Peer Champion work and educational events. The IRCNFF Campaign website has a wealth of information about domestic violence, how to support someone who is living with abuse, and a list of support resources in Ontario. Visit the IRCNFF Campaign website here.